Photos captured by infrared cameras at Huanglong Scenic and Historic Interest Area in southwest China's Sichuan Province show a wild panda sighting in the area, the second time that an adult wild giant panda was spotted in the area within half a year, according to the natural reserve area's management administration. Staffers from Huanglong Nature Reserve collected the data captured by three infrared cameras installed there. 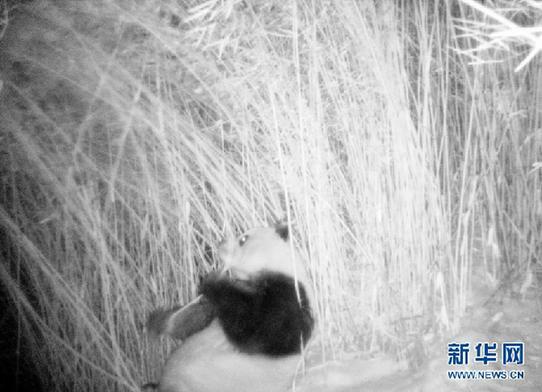 A total of 66 photos recording a panda eating were captured at night on Jan 21, and another 21 pictures were shot at noon on Feb 26 as a panda passed by the camera. Besides pictures, a one-minute video clip showing a panda passing by on Feb 16 was also available. It was the first time a wild panda was photographed eating in the region, according to the reserve. Researchers at the reserve said they couldn't confirm whether the panda spotted was the same one, and a further investigation is still underway. The reason photos of wild pandas can be captured frequently in the area is that more pandas are being attracted to the park due to the improved ecological environment in the area over the past three decades. Images of a wild panda were captured in the region last September for the first time in over 30 years.